"Chit Chat Chimp!" Earn 25% Commissions On All Front End And Upsell (Pro-Pack) Sales, PLUS An Additional 10% Commissions On All Ongoing And Recurring Payments For Account ﻿Lifetime On Each New User You Refer To Our Bot Building Platform...!! As consumer choice grows. The demand for 'customized ecommerce' and personalization has intensified. So the demands on our own businesses are changing too. INTRODUCING CHIT CHAT CHIMP! 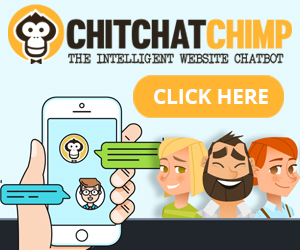 ChitChatChimp is a web based chat bot builder that enables users to create their own affordable chat bots in just minutes with ZERO CODING required. Bots to better support their customers, maximize engagement and drive higher sales conversions, gather feedback, even tutorial bots that can train their customers and visitors how to do specific tasks. All while saving the bot owner considerable time and expense! And a chatbot is the PERFECT way to make a visitor feel special and rewarded. Grab Promo Links & Tools Below - And Share This Amazing New Technology With Your Audience Today! We reward affiliates who make more sales for us with higher commissions!! *Commissions means total non refunded 'paid out' commissions after the 30 day refund period on a per affiliate account basis for the duration of a 12 month period. Once you have hit your target goals please contact our support team​ so your commissions can be bumped up. Please include your full name, email and product you promoted to hit your target. Use these as-is for best results. You can also use these as inspiration for your own messages so feel free to customize them, add them to additional content, add your own unique voice and style remind readers about your bonuses or incentives etc. - Why Don't You Have A Chatbot? - Future Proof Your Business Today. - The Secret Of Getting Ahead Is Getting Started! - Give Your Visitors & Customers What They Want! - Increase Engagement and Brand Loyalty on AUTOPILOT! A brand new chatbot builder 'ChitChatChimp' is now live and I urge you to check it out right away. Why? Because a cutting edge chatbot could REVOLUTIONIZE your business! Chat bots are growing in popularity, you may have already interacted with one yourself? ... So it's time to take a good look at what's happening around you right now. - Domino's Pizza uses a bot to accept food orders. - KLM's bot delivers boarding & flight time info. - Activision's bot engages fans of its Call of Duty series. - The Guardian newspaper's bot delivers news to readers. - Amazon's Alexa is forecast to be worth $20 Billion by 2020! As you can see, bots are everywhere and for smart business they're becoming ESSENTIAL (This year with good reason is set to become "the year of the bot"). The problem is until now they've only benefited the deep-pocketed blue chips, tech giants like Apple and Microsoft or businesses able to devote months to coding and training them. With ChitChatChimp all that changes! The good news is that a bot now DOESN'T have to come with a four figure plus price tag, they WON'T take you months to program and code (you can create a bot in minutes with ChitChatChimp) and you can start right away, whatever kind of business you have. - So stay tuned because this is going to be TRULY EXCITING STUFF that can change the way you work and the way your business prospers in the coming months. Could this monkey be trained to sell your products? Can a chatbot really boost your sales? 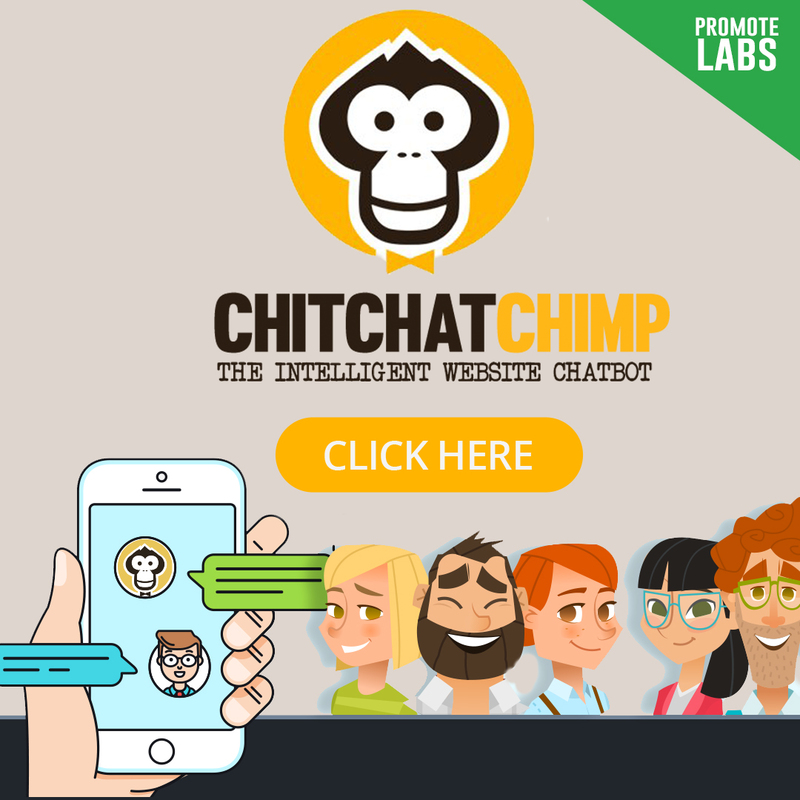 Yesterday saw the release of a brand new chatbot building platform called 'Chit Chat Chimp' and smart marketers everywhere are going bananas over it! Now as you already know, typical sales conversions fall somewhere between 1% - 5% - That means, even on a good day, 95 out of every 100 people who visit your site will leave empty handed. But we've come to expect it - It's a 'norm'... But it doesn't have to be. If you work hard to bring traffic to your site (or pay for the privilege) it's a HUGE waste of time and money. No matter how good your sales copy, it will never answer every question your prospects have. They'll have lots, all racing round their minds while their mouse fingers hover over your buy buttons. The more questions left unanswered, the less likely you'll ever get to see their cash. Answer their questions immediately. End doubts right on the page and remove any resistance to speed your buyers through to a completed sale. There's an added benefit too: Because your bot saves unanswered questions (and all chat logs) you'll be sitting on a GOLDMINE OF DATA and insight you've never had before. With Chit Chat Chimp you can use this valuable intel to tweak your sales pitch or restructure your offers making them even more attractive. Sometimes even the best offers need a little 'something extra' to tip people over the buying line. Set up your chat bot to 'bribe' visitors into buying right now. You can pre-load your bot with questions and answers along with custom greeting messages. So why not set the tone with an incentive? Train your bot to offer special bonuses, discount coupons, free shipping, two for ones, extended guarantees, trials or other perks that you know will encourage visitors to take action right there and then. If you leave visitors to go away and 'think things over' then most likely you've already lost the sale. And a chat bot is the PERFECT way to implement this tactic making the visitor feel special and rewarded. Using a chat bot also WORKS BETTER than just offering a perk somewhere on your page where it will be easily missed. It certainly doesn't feel like an 'extra' to your visitor because everyone gets it. When it's offered by bot IT FEELS REAL, it feels special in the same way when a salesman in a store adds something extra to 'sweeten the deal' for you in person. Try both of these ideas out today and I guarantee you'll see immediate positive results. Go build a sales bot and ramp up your conversions right now. P.S. In fact there's lot's more... Behind the main bot building platform offer there is a 'Pro Pack' add-on - This comes with even more cool conversion boosting extras - Things like 'Exit Intent' and 'Engagement Activated' bot triggers designed to maximize conversions to the limit! This employee will NEVER take a day off! What will you do with all this extra time? Save over $1,800 a year with a bot! Is support a problem in your business? In a recent survey at PromoteLabs over 70% of web business owners said they spend an average 15 minutes per day answering support and pre/post sale questions. That's not HUGE but it stacks up fast and as your business grows so do the demands on your time. SUPPORT COMES WITH A COST! If you do it yourself: It's 90 hours you could be doing more productive tasks. Which means - A chatbot built to handle support will save you money or give you back LOTS of time! - Keep customers happy with 24/7 'always there' support. - Save time by answering repetitive or common questions. - Reduce refunds by helping frustrated/confused buyers. - Save costs of live chat or helpdesk services fees. - Minimize support staffing costs. "Do you have set up instructions/videos"
"How can I access my products/downloads"
"How do I install this app/software"
"Where are the set up instructions?" "How do I unzip a file"
"Do you have an affiliate program"
"Can I get a discount"
"How much is shipping to ... "
Training a support bot will likely be an ongoing process but you only ever need to answer a question once. Once you've saved an answer, the next time your bot is asked that question it will know how to reply and respond accordingly. An easy way to create a great first impression. ZERO CHAT LIMITS - Your bots can have UNLIMITED monthly chats. NO ANSWER LIMITS - No limits on how many answers you add to your bot. NO TRICKY CODING - Create your first bot in just a few minutes. P.S. Watch for my email tomorrow I have another bot building idea that I know you'll love! Turn hands-free research into revenue... FAST! ... And it's simple thanks to the new chatbot building software "ChitChatChimp"
"Thanks for visiting, what topics should I write more about on my blog?" "What other types of products would you like me to review for you?" However your visitor responds, their answer will be saved to your dashboard as an "unanswered" question - For you that's INSTANT MARKET RESEARCH! To complete the bot's set-up you simply set a fall-back reply (the response your bot gives when it doesn't know the answer) to "Thanks I'll pass that information on - Have a great day"
BOT "Thanks for dropping by, what topics should I write more about on my blog?" YOUR READER "More on list building would be great"
BOT "Thanks for letting me know... You might like free report about list building (URL)"
Thanks to Chit Chat Chimp not only do you know what your readers are most interested in, but the next time someone responds that they want more on 'list building' your bot can instantly direct them to other posts, landing pages to grow your list and even paid offers relevant to their needs - Smart eh? And at the same time you are increasing the levels of engagement and the value you provide to your visitors you are also monetize responses with links to paid products, affiliate offers or lead magnets to grow your list with. If your visitors asks about a topic and you don't have any resources to recommend then it will revert to the fall back response and thank them for their feedback. "Thanks I'll pass that information on - Have a great day"
P.S. If you upgrade to our Pro Pack behind the main offer you will find even more cool extras such as exit intent triggering (get feedback when someone is leaving your site) and direct autoresponder integration which means you can build your list with just a bot no landing pages needed at all. Plus even more cool stuff. Jump in now and start making a splash! Now this type of bot is going to take a little longer to set up than most because you'll want to 'pre-load' it with lots of information BUT THE REWARDS WILL BE WORTH IT. Your bot doesn't have to know everything to start, but lots of pre-loaded questions combined with ongoing questions from your users will ensure it will quickly become an "expert" with massive ROI potential. You could even build an entire business around your smart assistant/teaching bots and charge for access. Once you've created your bot adding it to your website is easy, just add the code snippet (Works with WordPress and any other type of web page). Then to maintain your bot and keep things updated, simply login to your ChitChatChimp dashboard from any web browser (great if you are travelling) and add more preloaded questions/answers or add new replies to unanswered questions as they come in. Your visitors, customers and members are ALREADY waiting for this! It's just that now "you" can have multiple simultaneous training sessions and "you" can have them 24 hours per day, seven days per week and 365 days per year... even when you're on vacation and lazing by the pool. Have you built a chatbot yet? Did you check out the 'Chimp'? Have you joined the bot revolution [FIRSTNAME]? Just checking in to see if you've looked at ChitChatChimp yet? The last few days we've talked about the smart ways you can use chatbots to power up your business - Support bots, Sales bots, Feedback Bots, Training bots and more - Now it's up to you! - ZERO CHAT LIMITS - Your bots can have UNLIMITED monthly chats. - NO ANSWER LIMITS - No limits on how many answers you add to your bot. - NO TRICKY CODING - Create your first bot in just a few minutes. There's lots of reasons why you should act now during the launch and get a great deal... But the best reason to take action is because chatbots could be doing SO MUCH for your business. And LOT'S more - Don't wait and miss out these opportunities! P.S. Remember if you upgrade to the 'Pro Pack' behind the main offer you'll get even more cool extras such as exit intent triggering (get feedback when someone is leaving your site), extra avatars and direct autoresponder integrations which means you can build your lists with just a bot on your page. ** WANT TO EMBED A VIDEO INTO THIS POST? It's not HUGE but it does stack up fast and as your business grows so do the demands on your time. Which means - A chat bot built to handle support will save you money or give you back LOTS of time! - Save costs of live chat or help-desk services fees. And unlike support staff, your bots won't get tired, they won't arrive late at the office and they'll never call in sick. That's why training a support bot will likely be an ongoing process but you only ever need to answer a question once. Once you've saved an answer, the next time your bot is asked that question it will know how to reply and respond accordingly. And that's an easy way to create a great first impression! Go build a support bot - Your customers will thank you for it! We’ve come to expect it – It’s a ‘norm’... but it doesn’t have to be. If you work hard to bring traffic to your site (or pay for the privilege) all those visitors leaving empty handed is a HUGE waste of time and money. ANSWERING PRE-SALES QUESTIONS: No matter how good your sales copy, it will never answer every question your prospects have. They’ll have lots, all racing round their mind while their mouse finger hovers over your buy button. The more questions left unanswered, the less likely you’ll ever get to see their cash. There’s an added benefit too - Because your bot saves unanswered questions (and all chat logs) you’ll be sitting on a GOLDMINE OF DATA and insight you’ve never had before. OFFERING INCENTIVES TO GET SALES: Sometimes even the best offers need a little ‘something extra’ to tip people over the buying line. Set up your chat bot to ‘bribe’ visitors into buying right now. You can pre-load your bot with questions and answers along with custom greeting messages. So why not set the tone with an incentive? If you leave visitors to go away and ‘think things over‘ then most likely you’ve already lost the sale. And a chat bot is the PERFECT way to implement this tactic making the visitor feel special and rewarded. Using a chat bot also works better than just offering a perk somewhere on your page where it will be easily missed. It certainly doesn’t feel like an ‘extra’ to your visitor because everyone gets it. But when it’s offered by bot it feels real, it feels special in the same way when a salesman in a store adds something extra to ‘sweeten the deal’ for you in person. Try both of these ideas out today and we guarantee you’ll see immediate positive results. If you're an affiliate, blogger or if you sell your own products online, listen up because this will show you how to get all the valuable feedback you need from visitors and how to instantly turn that feedback into revenue and money in the bank! That's it! Collect all the info you need and it takes no longer than 5 minutes to set everything up. Cool Right? 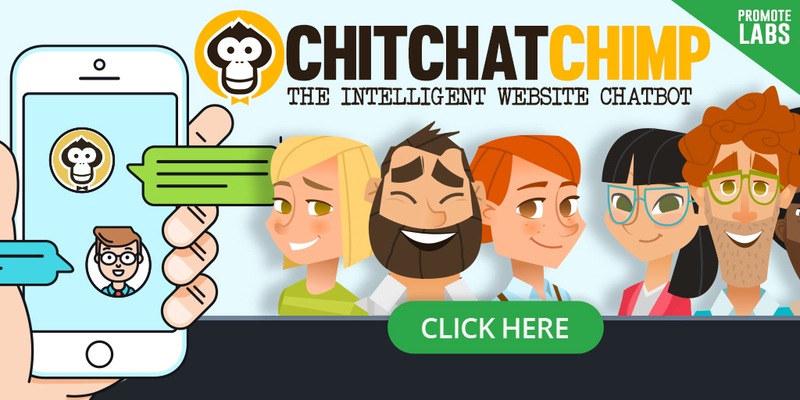 So check out ChitChatChimp here to see how you can start gathering all that valuable feedback. BOT: "Thanks for dropping by, what topics should I write more about on my blog?" YOUR READER: "More on list building would be great"
BOT: "Thanks for letting me know. You might like free report about list building (URL)"
"Thanks I'll pass that information on"
NOTE: If you upgrade to the Pro Pack behind the main offer you will find even more cool extras such as exit intent triggering (get feedback when someone is leaving your site) and direct autoresponder integration which means you can build your list with just a bot no landing pages needed at all. Plus even more cool stuff. Go build a feedback bot - And turn hands free research into revenue fast! Now this type of bot is going to take a little longer to set up than most because you'll want to pre-load it with lots of information, but the rewards will be worth it. Here's what you do: Pre-load your bot with lots of questions and answers about a specific topic or curriculum. - A bot that can give advice and support to new parents. - A bot that teaches them how to house train a puppy. - A bot that can guide customers through a complex instructions. - A bot that can teach your readers how to bake a cake. - A bot that can train site members how to use Facebook. - A bot that can train users how to launch their products. You could easily build an entire business around your smart assistant/teaching bots and charge for access. - Use a training bot to boost engagement and make your site sticky. - Use a training bot as an extra bonus to boost your product sales. - Use a training bot as a membership perk to increase stick rates. - Use a training bot as part of a high ticket coaching program. - Use a training bot to make targeted affiliate recommendations. Once you have created your bot adding it to your website is easy, just add the code snippet. Then to maintain your bot and keep things updated, simply login to your ChitChatChimp dashboard from any web browser (great if you are travelling) and add more pre-loaded questions/answers or add new replies to unanswered questions as they come in. The real beauty of this is that your users are essentially talking to you, asking you questions -It's just that now "you" can have multiple simultaneous training sessions and "you" can have them 24 hours per day, seven days per week and 365 days per year... even when your on vacation and lazing by the pool. 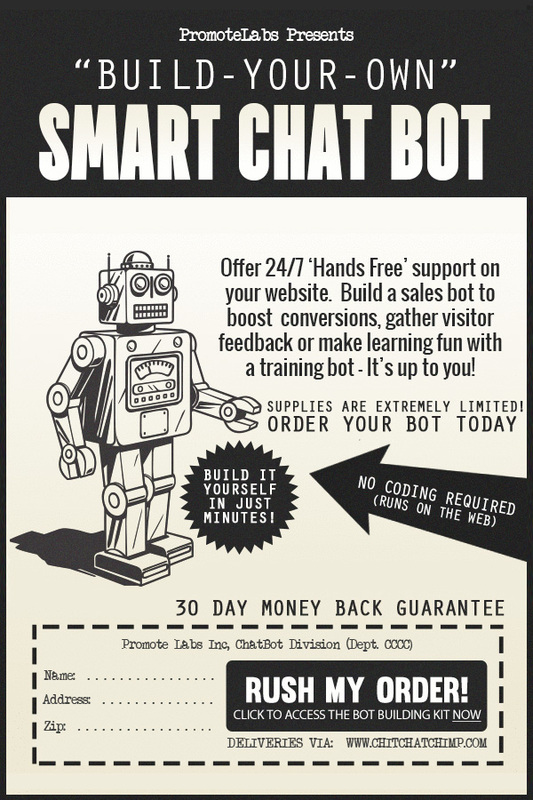 Build a training bot - Your Visitors Will Thank You For It! TIP: Click on any of the banner images above to open them in full size then right click and choose 'Save' to download the file. You can also embed the banners directly onto your website by copying and pasting the codes below each graphic. Important: Remember to replace [YOUR AFF LINK] with your actual affiliate link. Feel free to edit these done for you promotion pages with your own review video or comments and add your own bonus(es) or just use the page 'as is' if you don’t have anything to add. Of course the system gives you the Thank You page URL to use, just copy paste that inside your affiliate account for Bonus Delivery for your referred buyers and it's all done! Mailing to email lists that do not allow recipients to unsubscribe. Mailing to email lists via 3rd party systems or systems/emails that contravene the CanSpam laws. Mailing to email lists with subject lines like Make Money Now, How I Got Rich, etc. We request this to minimize bounce rates & complaints and we always suggest that you qualify your subscribers/lists before mailing offers to avoid complaints or low click/conversion rates. Sending "Spam" traffic from services such as Ad Fly or Traffic Monsoon - This type of "low cost" traffic negatively impacts conversion rates and rankings and you will be banned from this and future promotions if you use it. Using cash rebates. Using negative words such as scam in any PPC or promotional campaign. Using cookie stuffing or other methods of link hijacking. Note: Applying to promote to simply "self-buy" is strictly against our terms. We monitor for this practice and we reserve the right to cancel your account, your affiliate account, and cancel any commissions earned. Important: Do not misrepresent our product/offer and follow all endorsement rules and regulations that are applicable both in the country where you are based and in the countries from which you are sending traffic or advertising in. FTC offer guidelines and answers to common questions here. Please ensure you have reviewed these guidelines and comply where necessary with your marketing practices. Anyone found to be promoting our products in breach of these terms and conditions will be removed from our promotion programs without notice and any commissions marked null and void.